1. Preheat the oven to 180°C, gas mark 4 and line 2–3 large baking trays with baking parchment. Mix together the flour, muscovado sugar and ¼ tsp salt. Add the butter and rub together until the mixture resembles fine breadcrumbs, then stir in the spice and beaten egg and bring together to make a firm dough. Chill for 15 minutes. 2. Roll the dough out to the thickness of a £1 coin then use festive cutters to stamp out shapes – they need to be 6-7cm high. Using a small, sharp knife, cut out a notch at the base of each biscuit measuring 5mm wide x 20mm high. Place the biscuits on the baking trays and bake for 15-17 minutes until golden. Transfer to a wire rack and leave to cool. 3. Place the icing sugar in a bowl and whisk in the lemon juice until thick and glossy. Spoon some of the mixture into a small piping bag and pipe a border around the edge of each biscuit. Leave to set. Spoon the remaining icing inside the border (add a splash of water if necessary) and tilt gently to level the surface. Dust the biscuits with stardust and leave for 30 minutes to set completely. 4. 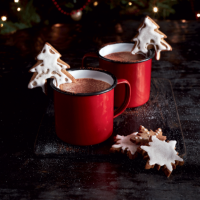 Serve on the rim of a mug of hot chocolate or a glass of sherry for Santa.